The complaints about European civilization seem to ignore the barbaric nature of humanity in many parts of the world before the Europeans got there. Spend a little time in the National Archeological Museum in Mexico City looking at the Aztec art depicting people having their hearts cut out and their heads cut off, or being skinned alive and then kicked down the steps of the pyramids in Teotichtlan, and it doesn’t take long to realize that there are worse things then European civilization. The Aztecs would gladly have succeeded in extending their EMpire to Europe, but they lacked the technology to do so. We should all be grateful the Spanish got to them first. which 'western 'civ' ' are you talking about?? The one in Denmark in the early centuries of this era when human sacrifice were common place? Or the 'western civ' that engaged in essentially piratic activity around the globe spreading their deadly diseases to humans around the earth, and slaughtering those who didn't succumb to their germs with their steel and their guns? Yeah. No point in being honest with ourselves about who we are and where we came from. It might hurt some folks' feelings. No Ghung. It just shows how much the left loves racial politics and virtue signaling. With them white man=bad. Everyone else=good. To be a white CIS male is to be literally Hitler in their book. Thanks for the comic relief, cog. I needed a good laugh this morning. Yup. Thats the one I'm talking about. You'd be hard pressed to find any civilization or culture on earth where human sacrifice wasn't practiced at some time in the past. And just about every civilizational and culture on earth also spent a good part of their history trying to invade and slaughter their neighbors to enrich themselves. Trying to pretend that western civilization is uniquely bad or has done evil things that other civilizations and cultures haven't done is just plain wrong. And, when you go into the particulars, in many cases western civilization comes out looking good in comparison to other cultures. For instance, using your example of "Tollund Man" (by the way---I've seen him in his exhibit in Copenhagen)---while its true that Celts and Romans and others engaged in human sacrifice, I'm not aware of any other culture that publicly tortured and slaughtered thousands of people annually in great public ceremonies the way the Aztecs did. And then they created huge "skull walls" where they displayed the rotting heads of the victims. The Ottomons used to create huge mounds of heads, but they only did it after military victories when they were slaughtering the defeated enemy. The Aztecs did it EVERY YEAR on their holidays. Their subject peoples were required to constantly send more victims to Tenochtitlan for slaughter. IMHO the Aztecs created a truly revolting culture. onlooker wrote: It is no small irony that Western Civilization bought us to our current height of technology and material abundance yet choses to apply an economic system that has marginalized and excluded many from benefitting from this abundance. Actually the data shows something quite different. Western Civilization and western economic policies and western technology have brought unprecedented levels of wealth to all levels of society all over the world. Yes, there are pockets of ignorance and poverty in the US and elsewhere in the world, but overall the wealth of the world and the wealth of average people has increased ENORMOUSLY since European Civilization began to spread its influence around the world. Cog wrote: No Ghung. It just shows how much the left loves racial politics and virtue signaling. With them white man=bad. Everyone else=good. To be a white CIS male is to be literally Hitler in their book. Enough with the what. WHY do you think that is? Plantagenet wrote: ......but overall the wealth of the world and the wealth of average people has increased ENORMOUSLY since European Civilization began to spread its influence around the world. Yep, we've done such a fine job we didn't have to concern ourselves with planetary limits, or whether the age of reason begot many more reasonable people. But who needs enlightenment when you have iPhones? But in general, I kind of agree that many other cultures engaged in depredations of various sorts. Western culture was the one to take it global (in a continuous way). GH, the 'why' is because of his programming. He can no more see that than a fish can see that he's in water. Because people will always choose to excuse their failures in life, if a suitable target can be found to blame someone who is not like them. The left has a fascinating hierarchy of victim status in which some victims of "white patriarchy" are more valuable to the cause than others. White liberals, both male and female, go along with all of this and feel guilty because they have been taught they are guilty of something just by being born white. It does create some real bizarre contradictions in the left world though. Muslims, even though they practice murder against gays and female genital mutilation, actually rank quite high in the left victim-ology scale. Higher than white liberal females by quite a lot. Somehow they are able to embrace a black supremacist like Louis Farrakhan and not have a problem with his anti-Semitism or separatist ideology. But the progeny of those who survived are mostly much better off now---at least in a material way----then they would've been without the spread of European colonialism and the spread of technology and economic and political ideas that came with it. Personally I think its tragic that much of the cultural diversity of humanity was lost as a consequence of western colonialism. But if you look at things like life expectancy, GDP per capita, educational attainment, etc. most of the people in the world are clearly much much better off in a material way then they would have been if Columbus had never sailed to the New World, opening the door to western Colonialism. GHung wrote: [...who needs enlightenment when you have iPhones? 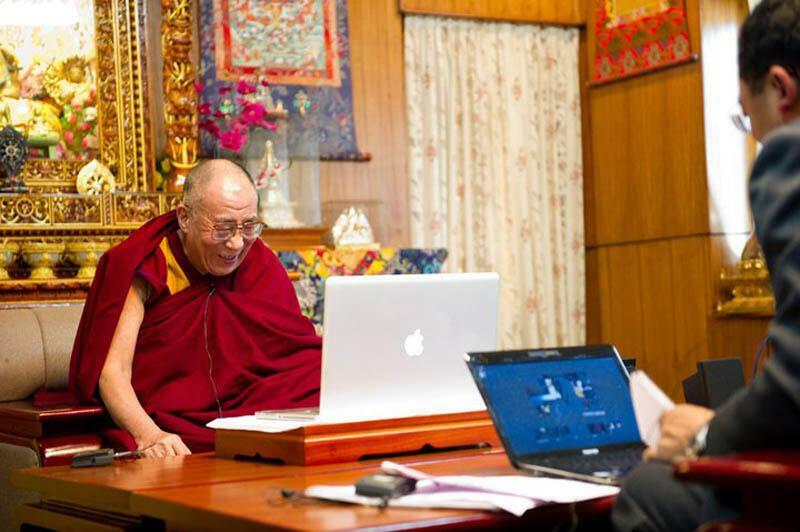 Even the Dalai Lama now uses an iPhone and works on a computer. "progeny of those who survived are mostly much better off now---at least in a material way"
well, some of them may not agree with your assessment, or at least they may say that having a lot of empty calories readily available to them is not a very good trade off for a life that has some dignity. De Tocqueville wrote about the US in the early 1800s, and his footnotes are full of true stories of Westerners who lived among Native Americans for a while and decided to 'go native.' If Western culture was so obviously superior in every way to especially these 'most savage' of cultures by comparison, there shouldn't have been any such stories. Of course, the voice in your head cannot accept this, so it will whisper to you that every single one of those people making a free choice for them selves must have been crazy. But maybe, in fact, it was and is Western Civilization that is crazy, and it is Industrial society, born form WCiv, that is insanely destroying the very lifeline we all, include most other complex life, depends on. Yes, its amazing the poor choices that some people make, isn't it. On the other hand, I'm lucky enough to have worked with lots of very bright and centered native Americans and Eskimos here at the University. Some native people are very successful at academic pursuits and are leaders in their own communities. Don't imagine that the unfortunate souls you are working with tell the whole story about the capabilities and intelligence and success of native peoples. dohboi wrote: De Tocqueville wrote about the US in the early 1800s, and his footnotes are full of true stories of Westerners who lived among Native Americans for a while and decided to 'go native.' If Western culture was so obviously superior in every way to especially these 'most savage' of cultures by comparison, there shouldn't have been any such stories. Thats where you are headed down the wrong path. Your suggestion that western culture is "superior in every way" to Native American cultures is just wrong. The actual story is quite a bit more complicated and nuanced then that. I'd try to explain it to you, but then you aren't comprehending what I've already said so lets just agree to disagree on this one.